So I called in sick to work today because I got food poisoning or something last night. Dangit! But at least I get the day off. I hope all of you guys are voting today or have voted already! This weekend I went with my airbrush teacher to a sweet sixteen party to do temporary tattoos. I was surprised because all the teenagers lined up for it! Temporary tattoos are a form of airbrush makeup as well. It can also be hand painted. You might not think of doing temporary tattoos as a makeup artist, but they bring in big bucks at corporate events. 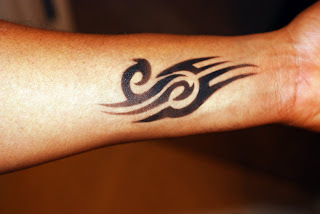 It's also good to know how to recreate tattoos for movies and on screen. I have my own kit complete with stencils, ink transfers and paint. Here are two tattoos I did on my boyfriend. This is the only thing he's ever let me try out on him makeup wise. The first one is a tribal tattoo on his wrist. This is the dragon tattoo I did on his arm. Are any of you guys tatted up? I've got one, on my lower back - a crescent moon w/ clouds and a star around it. I've got 5! haha. Hello Kitty, a paw print, blue cherry blossoms, my mom's chinese name, and an anchor. deng gurl u did that? 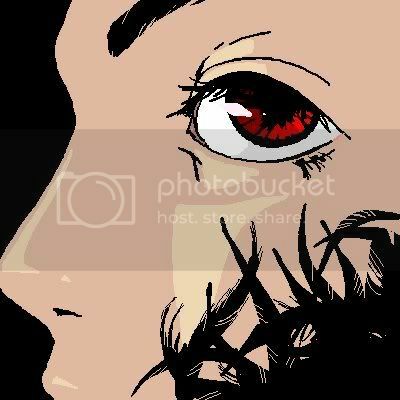 u r an artist! i have small tats.. i want a BIG ONE! when i have money tho.. wut about u? Nice job on your bf's tats ! 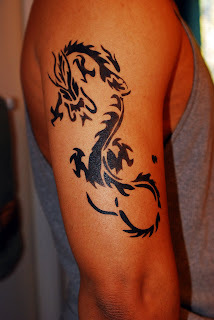 I like the dragon :] I have one on my ankle, an original design ! I plan on getting more.. SO addicting ! i wanted to answer you question about the brows. i answered on my blog as well albeit late, but i was saying that usually when my brows are as light as they are, it's a fresh bleach job lol. this time around i cut my hair very short. my brows aren't groomed properly so i resorted to cutting them super short. i use a combo of cork and swiss chocolate (for a bit more red) eye shadows to shade/fill. hth! I wish I had an airbrush! hehe. I have 1 tattoo, what about you?! great airbrushing work! and i love the pumpkin!!! omg u have no idea how happy i am about the election. no tats for me guys, i'm a wimp! what airbrushing system are you using? These are amazing!! Makeup By Ren Ren turns one year old! Makeup By Ren Ren's Huge Makeup Contest Giveaway! Kia and Ren talk Photoshoot Makeup! Blogger Feature with Couture Carrie!